2. Lilo & Stitch - I have a confession to make. When Lilo & Stitch first came out I absolutely loved it, but all in honesty I forgot about it until last year when I re-watched it for the first time in about 10 years! Now that I've re-discovered it, I wanted to re-watch it as soon as possible because it is one of the best Disney films! I did a whole load of fangirling on Twitter over David during this re-watch because WHAT A DANG SWEETHEART. 3. Emperor's New Groove - My first and only film this month that I've never seen before! I know, I know. I am the worst Disney fan. I wasn't really sure what to expect from Emperor's New Groove as the only thing I knew about it was "pull the lever Kronk" but now that I've seen it, I can definitely understand why it's so treasured to so many Disney fans! I have to admit that it didn't really feel like any other Disney film but then again that's true of a lot of other Disney films! My favourite parts were definitely whenever Kronk and Yzma were on screen - they were so hilarious! I'll definitely be re-watching in future. 4. Mulan - I call so many Disney films my favourites, but Mulan really is one of my most beloved films. I watched this while I was stuck in bed with a cold earlier this month and it was just what I needed! No matter how many times I watch it, that "would you like to stay for dinner?" - "would you like to stay forever?" bit always kills me! 5. Wreck-It Ralph - I've only seen Wreck-It Ralph a handful of times but I love it so much! It's such a clever concept, I can't understand why it's not more well-loved? I'm so looking forward to the second film though - I need more Ralph and Vanellope! 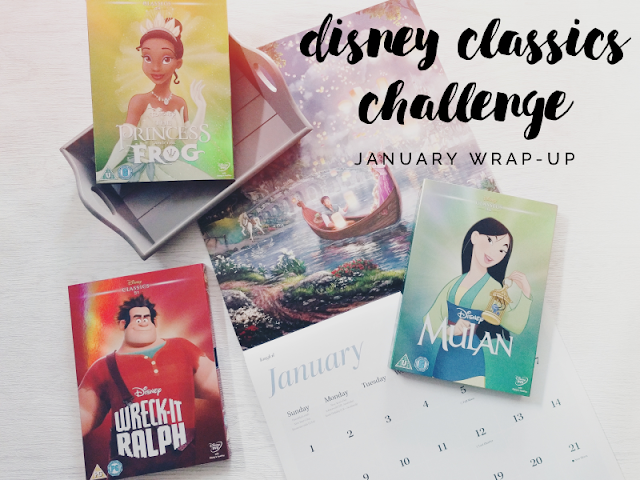 I'm hoping in Feburary to watch more than 5 films so I can really get ahead of this challenge! See you in a month for the next update!